I spent this last week in the mountains with my family at our favorite place. It was wonderful! One thing that I realized that I should share with you, as I was able to teach some people about this last week, is about how to properly pull someone out of the mud; how to extricate a vehicle with another vehicle after having gotten itself stuck on a muddy beach. I observed one vehicle which had driven quite close to the water on the sandy/muddy mountain lake beach. I knew from former experience that many vehicles get stuck on this beach because they drive too close to the water where the soil is too soft to support the weight of narrow tires and heavy vehicles. I figured that he was going to get stuck, which he did. I then observed a truck attempt to pull this vehicle out. As I watched the extrication effort I noticed that they weren't making any progress getting the stuck vehicle out. The vehicle that was stuck was a real wheel drive custom van which was stuck up to it's axle on the rear passenger tire. When a tire loses traction on an open differential all of the power is automatically transferred to the tire that has the least traction, the least amount of friction on the ground. The differential allows one wheel to spin at a different rate than the other on the same axle. When a vehicle makes a turn around a corner the inside tire turns slower around the corner than the outside tire. This is the purpose of a differential and its inherent weakness when driving off road. Four wheel drive is obviously superior but it still only makes a vehicle truly just a two wheel drive (one tire in the front and one in the back), if you follow what i'm saying. For these reasons locking differentials, posi-traction, limited-slip differentials, and traction control systems were invented. These systems prevent wheel slip and move the power to the tire(s) with the most traction. This helps avoid the excessive wheel spin which may get you stuck. Although I won't elaborate more on wheel spin now sometimes when you are driving off road you do need to get your wheels spinning, like in deep mud or sand. But as a general rule of thumb excessive wheel spin should be avoided, especially if you are a novice off-road driver. Excessive wheel spin and too heavy of a foot on the gas pedal will more times get you in trouble than get you out of trouble. In addition to getting you stuck, a heavy foot can break vehicle components and leave you even further stranded. There is a saying though, that I sometimes have to try, but don't live by; "When in doubt, gas er' out!" When the driver of the van tried to drive off of the beach the drive tires (real wheels in this case) started to sink into the soft ground. The one tire with the least traction began to spin and then dug itself a hole until it couldn't dig any longer because the vehicle was then sitting on the ground on its rear axle. The vehicle that was attempting to tow the heavy van out of its hole was a four wheel drive full size truck. This is a great vehicle to use for this purpose, but he couldn't get the van unstuck from just a single tire being buried in the mud. I ran over to the vehicles fearing that the tow vehicle would get itself stuck too and to help explain why they couldn't pull the van out. The tow strap that they were using was perfect; a 20' yellow 2" wide tow strap that was made just for this purpose. They had the strap attached in the perfect places; around the tow hook of the full size truck and around the frame of the custom van (because it did not have factory installed hooks). A 20' strap was a little short in my opinion for this particular case but since the full size truck did not get itself stuck in the mud then we'll ignore that for now. The truck was pulling on the van in a straight line, which is correct, but the van wouldn't move. My first advice to the driver of the truck was to give the van a yank. These yellow tow straps are made to 'jerk' a vehicle out of being stuck. These straps are meant to stretch thus lessening the impact to the vehicles and drivers. This works similarly to a rock climbers dynamic climbing rope. Although this rope is not 'elastic' it does stretch significantly because of the fibers that are used and the way the rope is constructed by braiding both the inner core and outer sheath of the rope. When a climber falls the stretching of the rope greatly lessens the impact to the climber. If a climber were to fall on a rope that does not stretch then the climber would most likely be injured just by the fall on the rope itself. I instructed the driver to give a few feet of slack on the strap and then step on the gas and give the stuck vehicle a jerk. He was a bit hesitant, as he had a nice truck and i'm sure that he didn't want to hurt it. I told him that this is what these straps were made for and the reason why the truck manufacturer had installed large hooks onto the front of his vehicle and to give it a try. I had him only put a few feet of slack in the strap at first so that he could gain some confidence in the process first. Since the first yank didn't get the van out of it's hole I instructed the driver to give a few more feet of slack in the strap. The second yank didn't pull the stuck vehicle out either. The driver then allowed for a few more feet of slack in the strap and then stepped on the gas which yanked the van out of the hole it had dug for itself. After the van was successfully extricated I instructed the tow vehicle to continue to stay attached to the van and continue pulling until they were far enough up the beach that they were both on solid ground. Not just a few feet out of trouble, but a good distance away from it. I wanted to illustrate this simple example to you because sometimes people have the right tools but just don't know how to use them properly. Do not try this technique with a chain or a tow strap that is inadequately large and strong enough. Using a chain is dangerous as it could damage either vehicle if it breaks. A chain does not stretch to absorb the shock of the load. If a chain were to break during jerking, or even during a static pull, either end of the chain could become a projectile which would be very dangerous to either vehicle or anyone found nearby. I day don't even keep a chain in your vehicle. 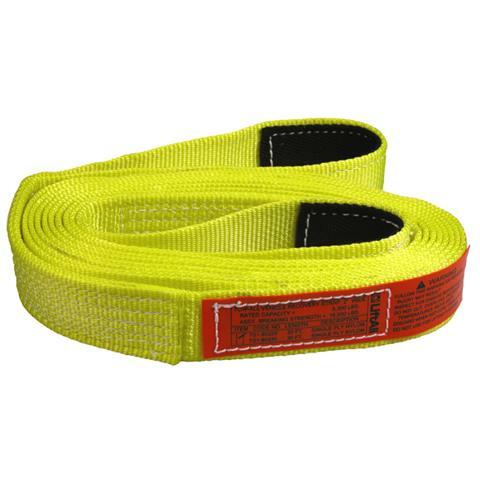 Get a good tow strap that is rated for your vehicle or the vehicle that you need to help get unstuck. I have used this method in the past to get a full size semi truck and trailer unstuck from the snow using my Toyota 4Runner. The semi was on flat ground and the hole it had dug was minimal but it was unable to move. I was able to jerk the semi hard enough for it to get out of it's little hole and get moving again. A key element to this process is for the driver of the stuck rig to apply a little bit of throttle, just enough to get the wheels turning. There are a few techniques you can use to avoid getting stuck. The first and obvious one is to stay away from the shores edge where the ground is too soft, especially if you are not driving a four-wheel drive vehicle. Second, when you sense wheel spin stop, get out and evaluate the situation. You can place sticks, branches or other material under that tire to get more traction and possibly dig away dirt/mud in front of the tire that may now be holding the vehicle back. Third, when you sense wheel spin put your vehicle in reverse and try backing out of that spot being careful to avoid too much wheel spin. This may also give you some additional distance where you can again drive forward and build some momentum to get through. This technique of 'rocking' the vehicle by switching from forward to reverse and back to forward again takes some practice but can occasionally get your vehicle out of a tough spot.